Before we start, we are not about to mud sling. It’s not classy, and it’s not helpful. Instead, we humbly suggest you consider alternatives when choosing an email marketing provider. And email marketing is not dead as some would have you believe. Email is still the primary channel for lead generation for 89% of marketers. But getting the right platform for your email marketing is half the battle. We’re aware that Mailchimp’s functionality is great. Lots of people use Mailchimp because a) they’ve heard of it and b) you can do a lot with it for free. Automated sequences. Running separate lists within a single account. Letting subscribers update their profiles. It’s all good stuff and many business owners swear by Mailchimp. Mailchimp might absolutely be the right choice for your business. But if you want to embrace the power of permission marketing? And you want to put your subscribers at the front and centre of what you do? We’d like to suggest an alternative. Websand. The focus over there is on lists. Specifically, the size of the list. It’s all about growing the list. Seeing growth in your list is important, but you need to put it into context. You could add 300 subscribers overnight with a new lead magnet. But if only 2 of those subscribers ever buy anything from you? At Websand, the focus isn’t on numbers. The size of your list doesn’t really matter. As we’ve discussed before, 80% of your sales come from 20% of your customers. So if you have a list of 10,000 regular customers, expect around 2,000 of them to regularly give you money. Websand provides your transaction data right there on your dashboard. You can see at a glance who those 2,000 loyal customers are. See? They are people, putting money into your business. What we care about, and what we hope you care about too, are these people on your list. When you grow your list using Websand, you grow an engaged community of loyal customers and users. Not a list. Think of it like cult 1960s television show, The Prisoner. A subscriber is not a number, he or she is a free individual! Instead of focusing on the number of subscribers, we focus on the surrounding data. As Cambridge Analytica unfortunately proved, data can be a double-edged sword. We like the nice kind of data. The kind that grows your business and provides a better experience for your customers. Remember, the total number of business emails sent every day reached 269 billion in 2017. With so much email doing the rounds, make sure yours count. First impressions count. Especially in crowded online marketplaces. No matter how much coding you do, your sign-up pages always look like every other sign-up page on Mailchimp. The series of confirmation emails also look formulaic. With Websand, you’re always in control of the design. You can brand all your emails, from the first welcome onwards. That helps customers learn to recognise you in their inbox. We should talk about templates. We’ve talked before about email templates. Mailchimp has a powerful drag-and-drop template editor. Users can create slick campaigns, full of graphics and sidebars and whatever else you care to add. The minimalists among you can send plain-text emails if that’s what your audience prefers. Remember, your audience’s preferences are more important than yours. But templates can cause your emails to look formulaic. Including too many images can slow loading times for your users. They can also distract if you try to add too much content. Subscribers don’t know what to click on first. Websand offers frameworks instead. Build your email based on six frameworks depending on what the email is for. Add images, text, whatever you need. Then simply clone that email the next time you need to send something and change the content. The content is the key here. Spend more time writing emails and less time playing with drag-and-drop template editors. Permission marketing relies on subscribers receiving the right message at the right time. Sending email blasts to your entire list serves what you need to say, but not what they need to hear. Mailchimp now offers automation even with its free plan. Users can set up nifty sequences guiding subscribers towards a sale. Segmentation proved to be the most effective email strategy of 2017. Marketers even report a 760% increase in revenue from segmented emails. 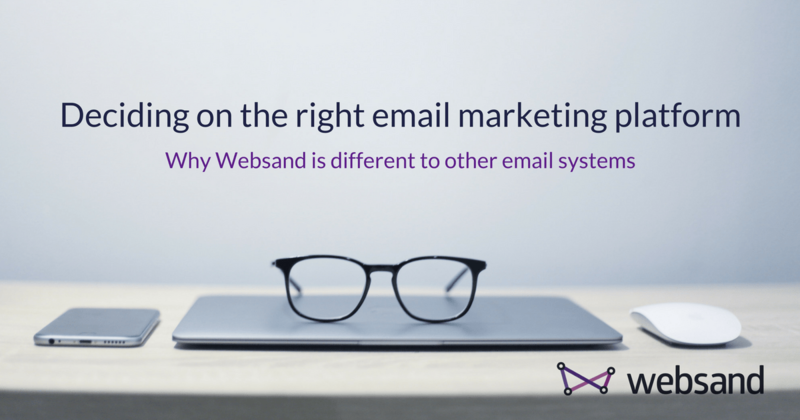 Websand has segmentation right through its DNA. Create segments based on pretty much anything. If you collect the data (with the correct consent of course), you can create a segment. SOURCE: Where people signed up, that’s really important (especially when collecting and recording consent). REPEAT: How many times someone has bought from you. PRODUCT: What products or services people have bought from you (or even which of your events they attended using the Eventbrite integration). RETENTION: When was the last time the person made a transaction. CUSTOMER LIFETIME VALUE: Segment based on how much each customer is worth. MARKETING: How people have reacted to your marketing (processed, delivered, opened, clicked). FREESTYLE: the other segmentation options are based on the mandatory fields in our subscriber or transaction API. Of course life is more complex than that, you’ll collect other data, that’s where freestyle segments come in. Using freestyle you can create any segment you like, from postcodes to job title for your customers, or product category, purchase stage or sku number for transactions. Provided you collect the data, you can segment that here. COMBINED: Add or subtract any of your existing segments together to make a combined segment. Mailchimp lets you ‘tag’ subscribers by putting them into groups. That might be based on products they’ve bought or which page they signed up from. Users can choose their own group on a sign-up form or you can decide the group for them. You can also segment lists based on how users interact with you. Set up a segment for users who haven’t opened your last five emails. Or create a segment based on location. You can add tags in Websand too, but tags are like tattoos, really easy to apply but damn hard to remove. The relevance of the tag can fade too, unless you constantly keep things updated but that takes a lot of focus, time and effort. So far, so similar. But in Websand, the segmentation is dynamic, so your audience is segmented based on their behaviour. It’s dynamic segmentation that allows you to be really targeted with your marketing as well as saving you loads of time. So set it up and let Websand do the rest. That’s really the crux of your decision to switch providers. The support. Do you want a provider who is with you every step of the way? Who’ll talk you through the software and help you get the most out of your account? A provider who sees you as a friend and customer, and not just another account? Then talk to us about getting set up on our platform. We start off at Mailchimp prices and we’ve totally de-risked you switching over as there’s no formal contract, just 30 day rolling. We also have GDPR-compliance baked right into the sign-up process. Just saying.